Below is a list of NCFCA Apologetics source material released weekly for competitors in the limited-prep category. 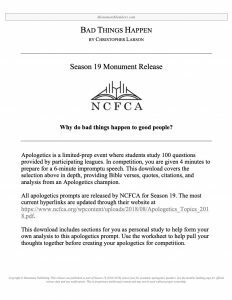 Members should download the material every week throughout the competitive season to make the habit of delving deep into the apologetics questions provided by the league. NCFCA Apologetics Release #34: “Natural Disasters” (4/8/2019)- This download includes sections for you as personal study to help form your own analysis to this apologetics prompt. Use the worksheet to help pull your thoughts together before creating your apologetics for competition. NCFCA Apologetics Release #33: “Unchanging Nature of God” (4/1/2019)- This download includes sections for you as personal study to help form your own analysis to this apologetics prompt. Use the worksheet to help pull your thoughts together before creating your apologetics for competition. NCFCA Apologetics Release #32: “God as Merciful and Just” (3/25/2019)- This download includes sections for you as personal study to help form your own analysis to this apologetics prompt. Use the worksheet to help pull your thoughts together before creating your apologetics for competition. NCFCA Apologetics Release #31: “God Allowing Sin and Evil” (3/18/2019)- This download includes sections for you as personal study to help form your own analysis to this apologetics prompt. Use the worksheet to help pull your thoughts together before creating your apologetics for competition. NCFCA Apologetics Release #30: “Does God Reveal Himself?” (3/11/2019)- This download includes sections for you as personal study to help form your own analysis the question: does God reveal himself to man? Use the worksheet to help pull your thoughts together before creating your apologetics for competition. NCFCA Apologetics Release #29: “Grace of God” (3/4/2019)- This download includes sections for you as personal study to help form your own analysis to this apologetics prompt. Use the worksheet to help pull your thoughts together before creating your apologetics for competition. NCFCA Apologetics Release #28: “Sovereignty” (2/25/2019)- This download includes sections for you as personal study to help form your own analysis to this apologetics prompt. Use the worksheet to help pull your thoughts together before creating your apologetics for competition. NCFCA Apologetics Release #27: “Holiness” (2/18/2019)- This download includes sections for you as personal study to help form your own analysis to this apologetics prompt. Use the worksheet to help pull your thoughts together before creating your apologetics for competition. NCFCA Apologetics Release #26: “Eternality” (2/11/2019)- This download includes sections for you as personal study to help form your own analysis to this apologetics prompt. Use the worksheet to help pull your thoughts together before creating your apologetics for competition. NCFCA Apologetics Release #25: “Transcendence” (2/4/2019)- This download includes sections for you as personal study to help form your own analysis to this apologetics prompt. Use the worksheet to help pull your thoughts together before creating your apologetics for competition. NCFCA Apologetics Release #24: “Omnipresence” (1/28/2019)- This download includes sections for you as personal study to help form your own analysis to this apologetics prompt. Use the worksheet to help pull your thoughts together before creating your apologetics for competition. 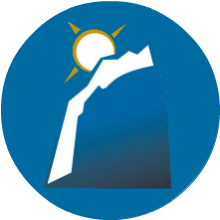 NCFCA Apologetics Release #23: “Omnipotence” (1/21/2019)- This download includes sections for you as personal study to help form your own analysis to this apologetics prompt. Use the worksheet to help pull your thoughts together before creating your apologetics for competition. NCFCA Apologetics Release #22: “Omniscience” (1/14/2019)- This download includes sections for you as personal study to help form your own analysis to this apologetics prompt. Use the worksheet to help pull your thoughts together before creating your apologetics for competition. NCFCA Apologetics Release #20: “Conscience” (12/17/2018)- This download includes sections for you as personal study to help form your own analysis to this apologetics prompt. Use the worksheet to help pull your thoughts together before creating your apologetics for competition. NCFCA Apologetics Release #19: “Biblical Canon” (12/10/2018)- This download includes sections for you as personal study to help form your own analysis to this apologetics prompt. Use the worksheet to help pull your thoughts together before creating your apologetics for competition. NCFCA Apologetics Release #18: “God’s Origin” (12/3/2018)- This download includes sections for you as personal study to help form your own analysis to this apologetics prompt. Use the worksheet to help pull your thoughts together before creating your apologetics for competition. NCFCA Apologetics Release #17: “Jesus’ Need to Die” (11/26/2018)- This download includes sections for you as personal study to help form your own analysis to this apologetics prompt. Use the worksheet to help pull your thoughts together before creating your apologetics for competition. NCFCA Apologetics Release #16: “Purpose of Church” (11/19/2018)- This download includes sections for you as personal study to help form your own analysis to this apologetics prompt. Use the worksheet to help pull your thoughts together before creating your apologetics for competition. NCFCA Apologetics Release #15: “Previous Lives” (11/12/2018)- This download includes sections for you as personal study to help form your own analysis to this apologetics prompt. Use the worksheet to help pull your thoughts together before creating your apologetics for competition. NCFCA Apologetics Release #14: “Divine Inspiration” (11/5/2018)- This download includes sections for you as personal study to help form your own analysis to this apologetics prompt. Use the worksheet to help pull your thoughts together before creating your apologetics for competition. NCFCA Apologetics Release #13: “See or Touch God” (10/29/2018)- This download includes sections for you as personal study to help form your own analysis to this apologetics prompt. Use the worksheet to help pull your thoughts together before creating your apologetics for competition. NCFCA Apologetics Release #12: “God Limited in Christ” (10/22/2018)- This download includes sections for you as personal study to help form your own analysis to this apologetics prompt. Use the worksheet to help pull your thoughts together before creating your apologetics for competition. NCFCA Apologetics Release #11: “Reconciliation” (10/15/2018)- This download includes sections for you as personal study to help form your own analysis to this apologetics prompt. Use the worksheet to help pull your thoughts together before creating your apologetics for competition. NCFCA Apologetics Release #10: “Image of God” (10/8/2018)- This download includes sections for you as personal study to help form your own analysis to this apologetics prompt. Use the worksheet to help pull your thoughts together before creating your apologetics for competition. 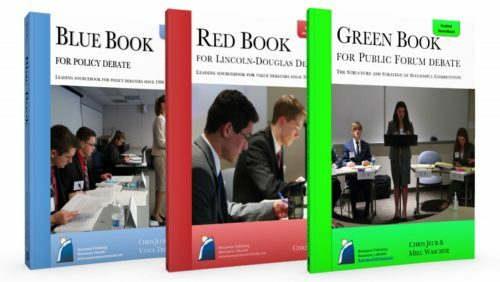 NCFCA Apologetics Release #09: “Verbal Plenary Inspiration” (10/1/2018)- This download includes sections for you as personal study to help form your own analysis to this apologetics prompt. Use the worksheet to help pull your thoughts together before creating your apologetics for competition. NCFCA Apologetics Release #08: “Righteousness of God” (9/24/2018)- This download includes sections for you as personal study to help form your own analysis to this apologetics prompt. Use the worksheet to help pull your thoughts together before creating your apologetics for competition. NCFCA Apologetics Release #07: “Incarnation” (9/17/2018)- This download includes sections for you as personal study to help form your own analysis to this apologetics prompt. Use the worksheet to help pull your thoughts together before creating your apologetics for competition. NCFCA Apologetics Release #06: “Atonement” (9/10/2018)- This download includes sections for you as personal study to help form your own analysis to this apologetics prompt. Use the worksheet to help pull your thoughts together before creating your apologetics for competition. NCFCA Apologetics Release #05: “Original Sin” (9/3/2018)- This download includes sections for you as personal study to help form your own analysis to this apologetics prompt. Use the worksheet to help pull your thoughts together before creating your apologetics for competition. NCFCA Apologetics Release #04: “Inerrancy” (8/27/2018)- This download includes sections for you as personal study to help form your own analysis to this apologetics prompt. Use the worksheet to help pull your thoughts together before creating your apologetics for competition. NCFCA Apologetics Release #03: “Transcendence” (8/20/2018)- This download includes sections for you as personal study to help form your own analysis to this apologetics prompt. Use the worksheet to help pull your thoughts together before creating your apologetics for competition. NCFCA Apologetics Release #02: “Preparing Cards” (8/13/2018)- An apologetics speech is written on a cardstock piece of paper that measures four by six inches. This document explains how you will prepare these cards and utilize the Monument Member Apologetics Template to make the most thorough of cards. Once you get into the habit that this document teaches, you’ll be well on your way to preparing for your first tournament. NCFCA Apologetics Release #01: “How to Do Apologetics” (8/6/2018)- The downloads we’ve prepared for you were designed specifically to help students in NCFCA answer the deep questions presented by competitive apologetics, to consider the questions from multiple angles and bring clarity to the issues given. Preseason: Competitive Speech (7/9/2018)- This preseason document introduces you to the most exciting world of competitive speech. Monument Apologetics Card Template (6/1/2018)- This download allows you to type in your apologetics preparation and save yourself from handwriting your cards.